While Germany gets the crown in the Photovoltaic (PV) market as king of new solar installations, other countries in Europe are ramping up their own plans for PV in 2010 and beyond, according to the PV market research ?rm iSuppli Corp. In fact, alternatives to Germany for investment are cropping up all over Europe as Return on Investment (ROI) rates in Italy and France are very attractive to investors. iSuppli is already seeing the majority of German solar investors branching out to these other countries in order to broaden their portfolio. However, as much as investors would like these other countries to become another Germany, financing and construction delays as well as the Feed-in-Tariff (FIT) situation in these countries remain challenging. Italy saw a surge of installations in the second half of 2010 due to an additional grace period of six months for installations built in 2010. In the first half of 2010, new installations in Italy amounted to 356 MW. However, with iSuppli forecasting 1.3 GW of installations in Italy for 2010, the second-half installations in the country far exceed what was installed in the first half. Looking ahead, investment conditions in 2011 and 2012 will remain better than in Germany. iSuppli sees investors and German installers moving part of their activities to Italy during these years, helping to accelerate PV market penetration. iSuppli forecasts that 2.0 GW of new installations will take place in 2011, with the possibility that the country could go beyond this level given that investment conditions will be excellent in the first half of 2011. The second half of the year could be much leaner for Italy, as FIT cuts in May and September may slow down installations in the country. 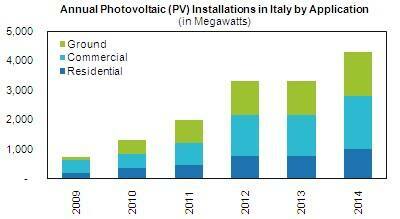 iSuppli forecasts new PV installations in Italy will grow to 4.3 GW in 2014, up from 720 MW in 2009, with 2.0 GW of new installations to come about in 2011. Meanwhile in France, while investment interest in the country is growing, future political support for PV in the country is becoming difficult. This is mostly due to very limited public support for solar, especially with a recent government report downplaying the role of PV and expressing the view that PV does not play a significant role in French REE targets. As a result, iSuppli has downgraded its 2014 new installation forecast for the French PV market to approximately 1 GW, down from 4 GW of new installations in that year. 2.4 GW of installations in 2008, the number of new Spanish PV installations should grow to 450 MW in 2010. While this is a remarkable turnaround compared to the previous year, iSuppli does not foresee the country growing to 2008 levels any time soon. In fact, due to looming tariff reduction, iSuppli expects annual installations in Spain to amount to 345 MW in 2011. And even though iSuppli does not see any future government support to improve the solar situation in Spain, the fundamental conditions in the country (high sunlight and free, desert-like areas) offer opportunities. As a result,. iSuppli expects annual installations in the country to grow to 800 MW by 2014. Some interesting developments are taking place as well among other countries in Europe. In Greece, the good news was that the financial crisis witnessed earlier this year and the overall Greek budget deficit did not completely stop PV business in the country.That said, the country is only targeting 2.2 GW of cumulative installations by 2020. In 2010, iSuppli forecasts annual installations will reach 100 MW, way up from the original forecast of 50 MW, with installations expected to grow to 400 MW in 2014, also up from our previous forecast of 200 MW. In the United Kingdom, fast growth in the country has iSuppli maintaining its forecast for 95 MW to be installed in 2010 with annual installations growing thereafter, the highest of which will be 600MW in 2014. This is likely due to the fact the country does not plan any extraordinary FIT cuts in the near future. In Belgium, iSuppli has reduced its 2010 installation forecast to 250 MW, down from 420 MW earlier this year. After a weak first half, the market is expected to gain momentum in the second half, amounting to 200 MW of this annual number. In 2011, we forecast the Belgium market will grow to 350 MW and to 600 MW by 2014. The growth in the EU Renewable Energy Targets is helping Belgium grow its solar market, and no government changes are expected in the near future—unlike Germany, France and Italy. While Germany will remain the key market to demand for PV installations in Europe in the next several years and will continue to be the leader, it is clear that other countries in the region are experiencing their own growth paths that will propel the solar market forward in the foreseeable future. Read More > PV in 2011: Growth or Decline?